Shed Three is one of four sheds on this 20 acre property just outside Christchurch. Perfectly located to be close enough to all city amenities but far enough away to escape the hustle and bustle. 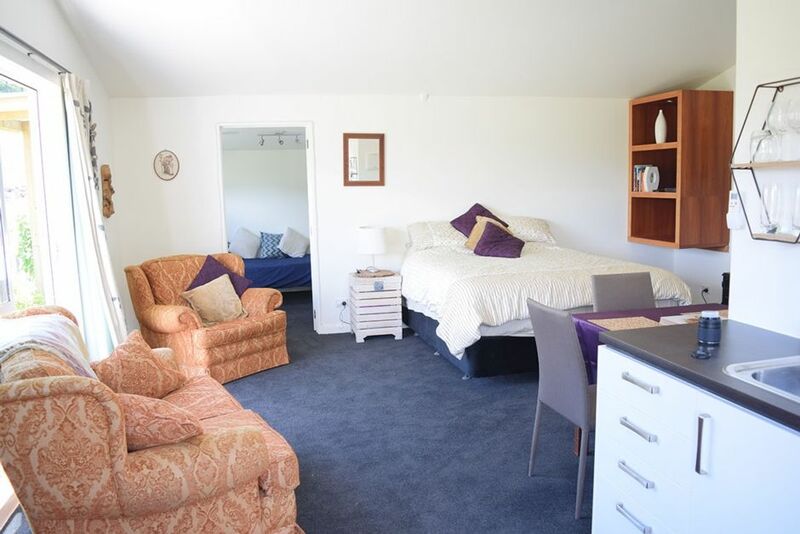 Private and self-contained with basic cooking facilities (kettle, microwave, toaster and single hob), bathroom (shower) and enough beds to sleep 5 people (King, Queen and single) Shed Three offers a home from home within easy reach of Christchurch. Netflix enabled TV and Freeview. Free Wifi, access to Spa and use of large trampoline. There is parking close to the door and plenty of room in the garden to relax or play. Note: Wifi is not super fast as we live rurally but it's good enough for Netflix. The Shed looks out out to pastures where retired racehorses and rescued donkeys graze. All are very friendly and will come and say hello if you are at the fence. This is a farm with animals. You need to be wary that you are in their space. We ask that you stay out of the paddocks. The donkeys are friendly but have sharp teeth - watch little fingers! This is a family home and so we request quiet after 10pm. Comfortable, clean, great supply of recreshments and breakfast. Lovely with animals around. Would definitely recommend. The accommodation was very cosy, warm and comfortable with everything you could need during a stay. The accommodation was very cosy, warm and comfortable with everything you could need during a stay. It was a very quiet & peaceful spot in which to relax. The outlook was lovely as from the accommodation you looked out onto a green paddock with horses. There were also chooks wandering about & some pigs nearby, all giving the place a lovely rural feel. We would definitely return if in the area again. Thank you for your lovely feedback. It was a pleasure to host you. A very well appointed and comfortable modern apartment in a quiet location. A very well appointed and comfortable modern apartment in a quiet location. Suited our needs perfectly to visit family nearby. Will definitely stay again next time. Thank you for your great feedback. We look forward to hosting you again next time you visit.